'PROUD Donegal man' Anthony Molloy has been honoured with the freedom of his native county surrounded by family and friends. The GAA legend was bestowed with the highest award in the county at a special ceremony at the County House, Lifford on Tuesday. Cathaoirleach Cllr Ciaran Brogan said the honour recognised Molloy's contribution to Donegal and national Gaelic football as well as his "excellent works as an ambassador among the Donegal diaspora". Council chief executive, Seamus Neely said the new freeman had used his success to help Donegal young people "by visiting schools and showing our youngsters the potential that they could achieve”. Current and former club members including former manager Brian McEniff and Molloy’s team-mates from ’92 attended the special ceremony. 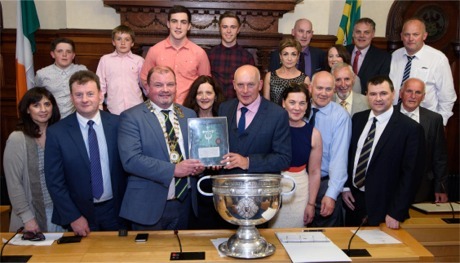 Family members join Anthony Molloy for a civic reception and awarding of the freedom of the county to the GAA legend in Lifford on June 7, 2016. Also in the photo are Donegal County Council ceo Seamus Neely; Cathaoirleach Cllr Ciaran Brogan and GAA county board chairman Sean Dunnion. 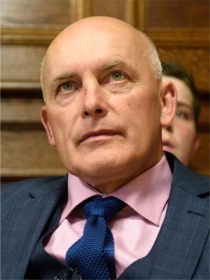 Anthony Molloy is only the seventh recipient of Donegal’s highest honour joining others including Packie Bonnar; Daniel O’Donnell and Phil Coulter.